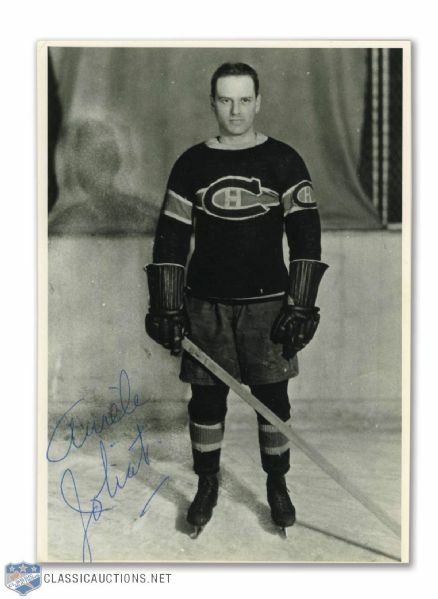 A splendid look at one of hockey's premier dynamos of the pre-war era is offered here, with Montreal Canadiens left winger Aurele Joliat autographing the 5" by 7" glossy photograph in bold blue ballpoint. EX copy of an original photo is dated, in what appears to be Joliat's hand, "Jan.-12-1981" on the back. Known as The Little Giant and The Mighty Atom, Joliat was obtained from Saskatoon for Newsy Lalonde in 1922 and embarked on a 16-year career with the Canadiens, helping the Habs to three Stanley Cup titles while lighting the lamp 270 times. Auction closed on Tuesday, October 30, 2012.